Black Ice Software - Auto-print SDK 14.82 is released! 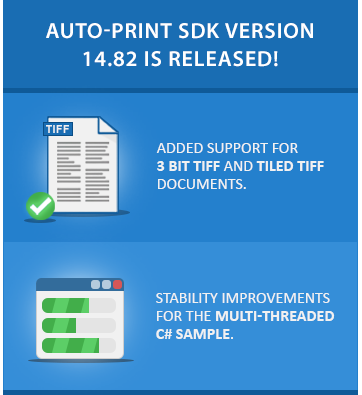 Auto-print SDK 14.82 is released! Stability improvements for Multi-Threaded Converter C# Sample, and new supported TIFF documents! Black Ice Software has released the Auto-print SDK 14.82. This version includes stability improvements for the Multi-Threaded Converter C# Sample for configuring the directories with environment variables. The new version of the Auto-print SDK includes new support for 3 bit TIFF documents and Tiled TIFF documents, greatly expanding the number of supported TIFF documents. Version 14.82 of the Auto-print SDK includes further stability improvements for using period character in custom file names when printing email files.